Waist reduction is steep for someone like me who has given birth to my first child only a year ago. I want to regain my original figure before my pregnancy, but I will be the first to admit that it is quite challenging. I do not have the time to exercise, what with all my new mom duties vying for my attention. Since I was not allowed to drink coffee and eat fast food during my pregnancy, I have been compensating, and it has taken its toll on my body as well as my self-esteem. It just makes me very happy that I have discovered waist training recently and it has helped me scrape 5 inches off my waist. I am overjoyed and would love to tell my friends and many other people who are interested in this great news. A couple of months ago, I was frustrated with my diet, and my body was not cooperating, but after I gave waist training a try, I felt a significant difference. I started using a waist trainer after a friend of mine recommended it. It was a particular kind because it was a post-pregnancy corset that would cinch my waist and support my abdominal region. I was amazed at how instant the result was. My posture looked better while I was wearing the corset and I was often sweating thus it helped me lose those extra pounds. My waist training journey begins, but my friends have already noticed the improvement. I have heard people say positive and negative things about wearing corsets and of course as a mother, and I want to be open-minded about them. I want to be healthy for my son which means I have to be careful about the diet, exercise regimen or new lifestyle I will adapt to my body. My husband has been supportive of this waist training endeavor that I just embarked on. He tells me to do what would make me happy. It is up to me now to continue this training and to get a couple of my friends involved too so we can do it together. Sometimes, the longevity of our lifestyle overhaul depends on the support of the people in our lives. Since I consider this a work in progress, I am always on the lookout for new articles online or books that will teach me about waist training. It turns out this is not a modern method of losing weight and sculpting the body. It existed a few centuries ago. Can you believe it? The question though is, does this work? From my own experience, I can say that wearing corsets will various benefits to the figure of a woman as well as specific mental benefits. My sisters have told me they have noticed a particular kind of confidence in me that wasn’t there before. Perhaps, it is due to the reason that now I am happy in my skin. My figure is curvaceous, and I feel sexier whenever I go out of the house. My husband is proud of my new found confidence, and that’s what makes me genuinely grateful about this waist training process. Take me as an example, and it’s not that difficult for any of you to get your pre-baby body back. To be fair, I also want to discuss the benefits and drawbacks of wearing corsets especially for someone like me who is a new mom. I was skeptical the first time I wore the corset. I was even afraid that it would damage my body that I went to a doctor to be sure that I was doing the right thing. My doctor told me that waist training could provide semi-permanent results, and he advised me to be careful at first. That’s what I did. I took extra care in putting on the corset, and I made sure I could still move and breathe while it was wrapping my body. My sister helped me get into the corset, but I chose one that can be closed in front so that I can put it on by myself next time. Since my doctor told me corsets are safe to use, all I really need to worry about was if they will be comfortable if worn for a few hours in a day. Mind you, and I was a little scared, so I just wore it for an hour the first day and gradually improved and increased the duration within the first week. I was happy with my progress, and my sister followed suit to support me. Here are a few things that I have discovered while wearing the corsets. First of all, I felt that it was snug on my body and it eliminated close to 3 inches off my waist in an instant. Of course, I am well aware that if I remove the corset, my body will go back to normal again but if I was patient and do this for a week, my figure will be comfortable with this adaptation. The compression brought in by the waist trainer makes my waist tense. The tightness helped me sweat a lot which naturally burned more fats, and I have observed that my appetite was also curbed. I didn’t feel the need to eat a lot of food while I was wearing the corset. Since I have already gone back to the office, my colleagues have started complimenting me on how confident I carry myself. My posture has dramatically improved, and I seem more proactive in meetings and discussions. When I relied on a waist trainer for a long time and didn’t do any exercise, my muscles seemed to wither and weaken. When I controlled the time for my waist training and kept the proper workouts on a regular basis, everything returned to normal, and I no longer had any excess fat. During the waist training, the shapewear was just one of the good parts, so it was recommended that everyone combine exercises for waist training. I have also experienced breathing difficulties with a waist trainer, but it will be fine when I readjust it. Remember to choose a waist trainer of the right size and not wear it too tight. Although, I felt a little hotter than usual because of the tightness of the corset and I wanted to stop. Thankfully, my sister encouraged me to continue so that I will have my pre-baby body back. Definitely, I questioned myself several times if it was just vanity that was motivating me but I realized, it was more my satisfaction with myself that I wanted to maintain. 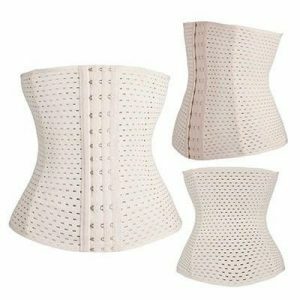 Throughout the time when I was wearing the corsets, I also read about how it can affect your body for the long term. Some women felt that it was painful to continue, but I was inspired by stories of perseverance that I have read in numerous blogs online. Within a couple of months, I did not give up, and I can see how much my body has adapted to this new waist training routine. I started eating less and made it a point to incorporate a healthy diet filled with fruits and vegetables. Waist training has helped me in so many ways, and I have embraced a healthier lifestyle than ever before because of it. I exercise regularly while wearing corsets or waist trainers which play an essential role in waist training. If you want to possess one, please click How to Choose Your Own Waist Trainer. Waist training is for moms like us. It can also be for everybody because single women would benefit from a sculpted body especially if they want to flaunt their bikini bodies this summer. Men, especially athletes, who want to have body definition and more discipline can wear waist trainers especially designed for them. I can speak for moms most of all that cinching your waist regularly will transform you into a better and more positive person. You will be ready to take care of yourself, and when you do that, you will have more capacity to love your spouse and your children. If you are confident and disciplined in your daily routine, there will be positive long-term results to be achieved. If you want to use 5-star rating methods to evaluate waist training, I will give five stars. I recommend waist training to everyone who wants to gain more confidence and change their perspective on body image. It is liberating to be in charge of the improvement of your own body. I hope you all give waist training a try and you will not only get a beautiful hourglass figure but also a lovely heart that loves yourself and the people in your life. If you are interested in the waist training after reading what I shared above, you can learn more in Practical and Effective Waist Training Guide.